Mission specialists Mike Massimino (right) and Mike Good (on arm) work outside space shuttle Atlantis during the fourth spacewalk of STS-125 on May 17, 2009. Thisstory was updated at 8:41 p.m. EDT. HOUSTON -Two embattled astronauts fought through a stuck bolt and dead battery on Sundayto fix a key instrument in the Hubble Space Telescope in a frustratingly longspacewalk. Atlantisastronauts Michael Massimino and Michael Good were already expecting achallenging day to repair a long-broken spectrograph on the 19-year-oldHubble. The instrument was never designed to be fixed in orbit. Ultimately,the astronauts completed their repair work on Hubble?s ailing Space TelescopeImaging Spectrograph (STIS), which failed in 2004. But it was a long, toughhaul that prevented the spacewalkers from finishing all their tasks. ?Congratulations,you brought STIS back to life,? Atlantis astronaut John Grunsfeld told thespacewalkers. Thespectrograph, which can double as a camera, passed an initial power-up test,but shut down soon after due to a temperature glitch, NASA officials said. Hubbleprogram manager Preston Burch said engineers at the telescope?s missionoperations center at the Goddard Space Flight Center in Greenbelt, Md., would reattempta more in-depth functional test once the spectrograph warmed up later thisevening. Thespacewalk began at 9:45 a.m. EDT (1345 GMT) and lasted just over eight hours,making it the sixth longest in history. It was the fourth of five back-to-backspacewalks by Atlantis astronauts extend Hubble?s mission life through 2014. Sunday?sstring of bad luck for Massimino and Good began early in their spacewalk. Astuck bolt, one of four securing a handrail to the exterior of their targetspectrograph, simply refused to budge. It was such a simple failure, NASA neverexpected or simulated it, mission managers said. 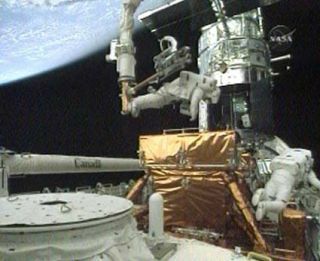 Thehandrail had to be removed so Massimino could attach a special plate on thespectrograph that would catch the 111tiny screws securing a cover in place. But the bolt appeared stripped andhis power screwdriver kept slipping. An extratool bit didn?t help. So Mission Control told Massimino to just rip it off by bendingthe handrail until the bolt popped free. The astronauts taped up pieces of thehandrail and the bolt to make sure nothing shot out like a projectile. ?This isjust like tying branches together in Boy Scouts,? Good said. After almost twohours of work, Massimino got the rail free. But it took some muscle and heasked for a break. Mission Control concurred. ?I don?tknow how to describe what just happened, but after what just happened I thinkwe all need a minute to straighten things out,? he said. Then a powertool?s battery failed sending them scrambling for a spare, which took moretime. ?Oh, forPete?s sake,? said an exasperated Massimino. With thehandrail clear and the power tool charged up, Massimino and Good pressed aheadwith their repair. Hubble?sbroken Space Telescope Imaging Spectrograph is a versatile instrument thatbreaks light into component wavelengths to detect supermassiveblack holes and the chemical makeup of the atmosphere around distant alienplanets. It was installed in 1997, but failed five years ago. Because thespectrograph can also double as an imaging camera, the instrument was one of Hubble?smore unique features. ?Thescience capabilities that we?ve been given today are fabulous,? said JenniferWiseman, chief of exoplanet research and stellar astrophysics at Goddard. ?Nowwe?re going to start contemplating what kinds of things we can do with them.? Afterremoving the 111 tiny screws and six other fasteners - which were all capturedin a special enclosure - they replaced a power supply circuit board and thenbuttoned the spectrograph up with a new cover that only required two latchesand a single bolt to secure. The hand-intensive work cut a small tear in theoutermost layer of the palm on Massimino?s left spacesuit glove, but he wasnever in any danger, mission managers said. The apparentlysuccessful repair was the second intricate fix in as many days for the Atlantiscrew. On Saturday, the astronauts revived Hubble?smain camera, which shutdown in 2007. They also added a powerful wide-fieldcamera, new gyroscopes and batteries, and a brand new spectrograph designed tostudy the structure of the universe. ButMassimino and Good ran out of time Sunday and had to skip a task to add extrainsulation to Hubble. That chore might be added to the mission?s fifthspacewalk - the last ever for Hubble - is slated for Monday. Grunsfeldand astronaut Andrew Feustel will perform that final spacewalk and be the lastpeople ever to touch the space telescope. Atlantis is flying NASA?s fifth andfinal mission Hubble in order to extend its life through 2014. After theexhausting spacewalk, Massimino and Good returned back to Atlantis? airlock toconclude their orbital work. The spacewalk was the second and last scheduledfor both astronauts for the rest o the mission. ?It?s areal privilege to see what we've seen and to work on this magnificent machine,?Massimino said. "I couldn't be any more grateful for theopportunity." SPACE.comis providing continuous coverage of NASA's last mission to the Hubble SpaceTelescope with senior editor Tariq Malik in Houston and reporter Clara Moskowitzin New York. Click herefor mission updates, live spacewalk coverage and SPACE.com's liveNASA TV video feed.